Marketing plays an important role when it comes to growing your home business and that’s the area where most people struggle. Having the right marketing tools can make a huge difference in sales and income from your home business. These free marketing tools for home business can take your revenues to the next level. Whether you are a newbie in business or marketing or an experienced home business owner, there are several free marketing tools for home business that can really make your life easier. As a small business owner you have to do most of the things yourself and to help you with marketing we have listed some of the best marketing tools for small business that you can use in 2019. Whether you sell health supplements from your home or provide home cleaning services, you cannot ignore social media as it gives you direct access to a huge customer base both locally and across different states. There are some of the free social media tools that will help you manage your social media profiles from one single dashboard and keep your audience engaged. These free social media marketing tools for small business not only help you manage your social medial pages but also schedule new posts and keep your audience engaged. Hootsuite – It’s the most popular social media management tool that allows you to schedule and publish posts on your social media profiles from a single dashboard and the best thing is that you can manage up to three accounts within one dashboard under its free plan. Hootsuite is among best marketing tools for small business. Buffer– Buffer is among the top free online marketing tools that help you in managing your social media profiles, pages and schedule posts ahead of time. Under it’s free plan you can connect one profile per network including Twitter, Facebook, LinkedIn, Google+, and Instagram. MeetEdgar – MeetEdgar also helps you in scheduling and publishing posts similar to other social media management tools but it can make a huge difference when it comes to user engagement as it automatically re-shares your most popular posts. Great Content is the king in today’s digital age and people are hungry to consume informative content. The question is, how you can discover and create error free content to share with your audience on social media and your website? Scoop.it – Allows you to navigate, curate and create web pages that are relevant for your business. Scoop.it also makes it easy to share your topic using widgets, RSS feeds and social media tools. Spundge – Spundge allows you to create, curate and deliver great content, but it also goes one step further, letting you collaborate with experts to add authority to your content. It is a great tool as it helps you pick relevant topics, keywords and people, and Spundge creates “Notebooks” and “Stories” around them. Feedly – Feedly allows you to gather, organize and personalize content which is relevant to you from different sources on the web in a single location for easy access and sharing. It is a great tool as it monitors the web for gathering relevant content, based on websites you like and sorted by date and relevance. Klout – Klout is another great tool tool to create and share great content, based on your social networks. It is one of the most efficient social discovery tools, as it allows you to find great content quickly. When it comes to home business, you cannot ignore your business website as it is your digital identity and helps customers find your business online. 70% of the websites in the world really don’t generate any business for the owners because they are not optimized properly or lack essential SEO elements. These free tools that help you with SEO of your website and push rankings in search engines. 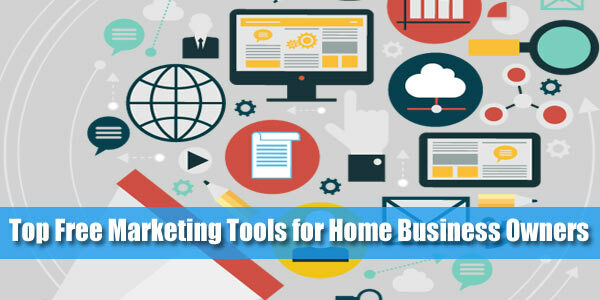 These tools are among the best free marketing tools for home business. Semrush – It is one of the most popular tool on the web that help you improve your SEO score by analyzing competitor websites, social scores and giving you an in-depth report about your website presence compared to the competitor websites. Based on the reports and suggestions, you can make improvements to your website and create backlinks to improve your rankings. It will also help you discover relevant keywords for your website. Keywordtool.io – You have to register for a free account and this great tool will help you with up to 750 long-tail keyword suggestions. Pingler – Allows you to check the indexing of your website’s pages in google and bing. Not only this, it will help you in discovering how spiders crawl and look at your website based on which you can make improvements to your code. It has many other SEO tools that are really useful in pushing your search rankings such as extracting keywords from competitor websites. So, by now you know how to create great content but what about spreading your business name on the market? Press releases play an important role when it comes to publicity and spreading a word out about your business. We have listed some of the free publicity tools that it make it to the list of free marketing tools for home business. Prlog – It is a free press release distribution service that allows you to publish your press releases about your business or company and gain visibility in search engines. OnlinePR Media – It is also a press release distribution website that offers free press release publishing under its free plan. You can also opt for paid plans for better distribution of your press release. HARO (Help a Reporter Out) – The HARO report is probably one of the most well-known resources for matching media and experts. You can simply sign up as a source, and scan the three emails sent each weekday for media sources needed help on a story. Source Bottle – It is also similar to HARO where you can help journalists discover news and stories but here’s a twist as you do not have to wait for the emails instead you can pitch online about the stories and news. One of the most important aspects of successful marketing is analyzing the data that you generate over a period of time. It can be your website’s traffic data or customer feedbacks and reviews. Here are some of the free tools that are very useful in analyzing your website’s traffic as well as customer feedbacks and reviews. Google Analytics – It is simple to setup and a free service by Google. It helps you in monitoring your website’s traffic, user engagement and the most popular pages of your website. You can make improvements to your website easily based on the analytics data. Hotjar – Under it’s free plan it allows to collect data on up to 2000 page views a day. One cool feature is the heat map that lets you know where visitors are spending time on your site. Simply Measured – It is another free to use tool that helps you in analyzing you social media engagement data by generating insightful reports. You can get information from all major social networks including Facebook, Twitter, LinkedIn, Google+, Instagram, and Pinterest. As human beings we love to consume pictures, graphics and info-graphics faster compared to the text based content. Logo design, banner design and brochure design has always been an area where we end up spending lots of money but not anymore. LogoCrisp – Allows you design your perfect logo for your website or business. You can choose from thousands of professional logos and customize them as per your needs for free. Canva – it is a wonderful tool that allows you to create brochures, facebook banner, blog post picture, or ebook cover. Canva offers many free images and you can also upload your own. You can add text overlays, shapes and more to your image and then download or share it. Pic Monkey – It is another tool that allows you to create your own banners using your images. Simply upload your images and then edit; cropping, resizing, adding text and more. Video marketing is equally important in today’s time as the content marketing. People consume video content faster and love to share engaging videos in their network. When it comes to video hosting and marketing, youtube is the number one choice among small business owners to large brands and why now it is absolutely free to host your videos and share them with the world. But before you can share your videos, you may want to edit them and add animation effects and information to it to make them more engaging. Renderforest – is an online video editing tool that allows you to edit your video directly from your browser. Under their free plan you can edit upto 3 min videos and also get 500 MB storage. Kizoa – is another online video editing tool that allows you to cut video clips, create intros and outros and add music to your videos. Youtube – The number one video hosting and live streaming video website on the web today. It is owned by google and has the largest user base in the world. Almost everyone knows youtube and you can host your educational, tutorial, marketing videos for free. Wistia – Wistia offers a free plan that allows hosting three videos. Features include customizable player, embedding and sharing, lead generation tools, integration with third-party apps such as MailChimp and more. Vidmeup – offers many great video hosting features that are included in the free plan. The best thing is that you can add your own domain, upload up to 750 MB, and customize your video page and more. Boast – It allows you to collect customer testimonials in from of text, video or photos. Simply add a snippet of code to your website or instantly send out the link provided in your account and as soon as customers post a testimonial you can approve them from a single dashboard and post to your website or even share video testimonials on youtube. Zoho CRM – Zoho offers some of the most sought after tools to run your entire small business on it. It’s CRM software allows you to manage leads, prospects, build your sales funnel , schedule emails and close more deals easily. You can signup for a free trial and keep using it if you don’t want to upgrade. Hubstop CRM – Hubspot’s CRM is free to use and it has everything you need to organize, track, manage and nurture your leads to close more deals. Suite CRM – It is open source software that lets you manage workflow, your sales pipeline, streamlines your customer service and more. With the help of the right marketing tools for home business you can enhance your online presence and boost your sales quickly. Marketing has to be effortless and automated so that you can focus on other aspects of your home business. The above mentioned free marketing tools for home business will definitely help you grow your business and become more organized. So don’t wait to get started with testing each of those free marketing tools for home business and choose the ones that suit your needs. Note: Over 10,000 small businesses in the US generate 100% income every month with the world’s leading online presence, free business website, company emails and free success marketing for 365 days. Get started Free with Advanton!